| New York, NY – September 28, 2017 | Wolf-Gordon’s wide range of acoustical materials is perfect for sound mitigation in a multitude of interiors, including hospitality, healthcare, retail, or office environments. These materials—from wallcoverings to upholstery and drapery—have diverse commercial applications. “Wolf-Gordon’s catalog of acoustical applications provides a host of options for sound mitigation, particularly important in modern, open-plan office environments that require respite from ambient noises. Acoustic sheers by Vescom are a great solution for these types of floorplans because they are able to cancel out noise while remaining atmospheric.” Marybeth Shaw, VP, Design and Marketing. 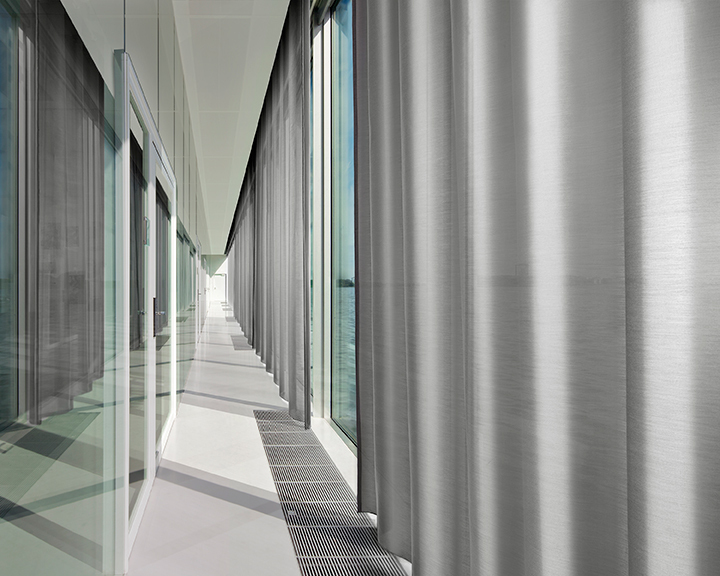 Wolf-Gordon has expanded its offering of Acoustical Sheers by Vescom: Carmen, Marmara and Formoza. These beautiful, translucent draperies trap and diminish sound reverb when hung 5 to 7 inches from a surface such as glass, concrete or drywall. The curtain fabrics are extremely lightweight, thin, and possess strong colorfastness. Carmen has a fluted texture with a shimmering surface, now in 9 different colorways. Formoza has a more industrial look with stitching that runs the length of the fabric in 11 colorways. Marmara resembles an elegant lightweight wool in 24 colorways. American-made and sustainable, Wolf-Gordon’s high-performing acoustical wallcoverings combine superior noise absorption with a unique, dimensional fabric. They offer durability and easy maintenance, and are ideal for masking wall imperfections and rough surfaces. Made from 100% recycled materials, the energy efficient manufacturing process eliminates waste, reduces carbon footprint, and supports Wolf-Gordon’s initiative to maintain sustainable practices. The finished product can also be recycled back into fiber at the end of its lifecycle. Felted, a soft and notable material of the namesake construction, is available in a complete spectral palette and can be laser cut or digitally printed. Felted can also be produced without the wallcovering backing, for use as upholstery or other vertical applications. Softrack is a long popular Wolf-Gordon acoustical wallcovering that can transform any space into a sound-absorbing environment while remaining discreet. In Wolf-Gordon’s own headquarters, recently designed by Lewis.Tsurumaki.Lewis Architects, Softrack was applied to acoustical panels that stretch the length of the open office benching system to provide additional sound mitigation beneath the open ceiling.